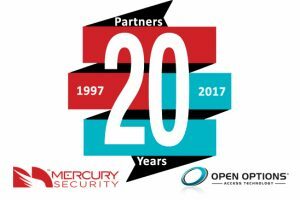 LONG BEACH, Calif., Sept. 18, 2017 – This year marks the 20th anniversary of a successful partnership between Mercury Security, a global leader in the supply of OEM access control hardware and Open Options, the leader in open platform access control solutions. For two decades, the companies have collaborated to deliver cutting edge security systems that meet the unique requirements of customers all over the world. As the companies celebrate their long-standing partnership, Mercury and Open Options are more focused than ever on delivering open platform-based access control solutions. As a Platinum Elite partner, Open Options products and solutions leverage Mercury’s open hardware platform for interoperability, support for open standards such as PSIA, OSDP and BACnet, and third-party integrations that include wireless lock products, elevator control, and identity management applications. Additionally, Open Options supports Mercury’s M5 Bridge series for Casi retrofit applications and the award-winning MS Bridge series for legacy Software House conversions—both of which offer end customers a seamless migration path to the future. “Open Options has the unique ability to package and accelerate time to market for Mercury products, making it possible for them to quickly develop new solutions that improve the end user experience,” said Barnett.